The Tuscaloosa County Emergency Management Agency (TCEMA) maintains outdoor warning sirens that alert the public about tornadoes. If a natural disaster were to strike in Tuscaloosa, Alabama, the Tuscaloosa County Emergency Management Agency (TCEMA) would provide leadership, planning, education, and resources to protect lives, property, and the environment. The multijurisdictional organization—jointly funded by the City of Tuscaloosa, the City of Northport, and Tuscaloosa County—serves all jurisdictions and stakeholders in the county, which is Alabama’s second largest by land area. TCEMA also coordinates state and federal resources when any are needed in a disaster management situation. As part of its disaster preparedness and planning operations, TCEMA maintains outdoor warning sirens located throughout the county. 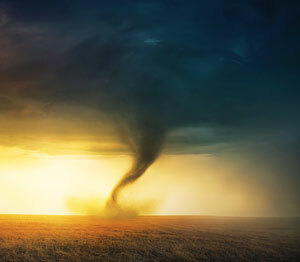 These sirens are used to alert the public about tornadoes, which are relatively common in the southeastern United States. As early warning tools, they are also critical to managing disaster response activities, including mobilizing first responders, coordinating storm shelter needs, and facilitating timely evacuations. TCEMA needed a way to track not only the siren assets but also its fleet and equipment. Which is why the agency opted to gain location intelligence using the ArcGIS platform along with Esri partner Lucity’s enterprise asset management system. Siren data is now housed in Lucity’s enterprise asset management software, which links the GIS features to their related maintenance work orders and cost estimates. With its tornado siren data strewn across spreadsheets, shapefiles, SDE files, map books, and other paper records, TCEMA was finding it challenging to track the various activities related to doing siren inventories; conducting inspections; performing maintenance; and putting together reports for the Federal Emergency Management Agency (FEMA), since many of the sirens were purchased with federal grant funding. Monitoring these activities was inefficient, time-consuming, and costly—and most importantly, it affected the agency’s ability to maintain up-to-date information about the sirens to adequately forewarn citizens of potential danger. To fix this, TCEMA began by making it easier to document inspection and maintenance data. Starting in January 2017, TCEMA identified and validated information about all its sirens in the field. 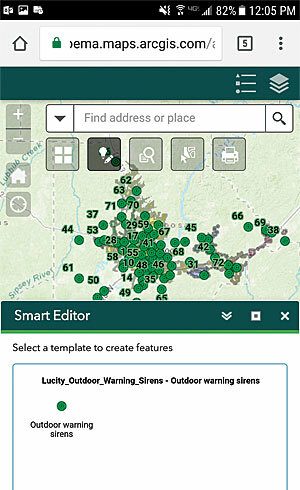 Then, the Tuscaloosa County Public Works (TCPW) department, as a collaborative partner, imported the existing siren shapefile features into its enterprise geodatabase. Finally, Jeannette Byrd, a mapper and GIS analyst at TCPW, set up a web feature service to publish this data to the field via ArcGIS Online. Within approximately three months, TCEMA had a functioning field solution. 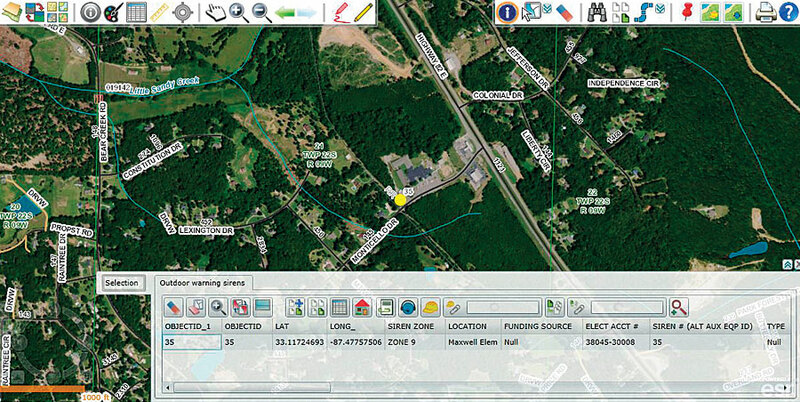 Now, using an easily configured Survey123 for ArcGIS app that TCEMA built, authorized users from TCEMA and TCPW can visualize and interact with the siren features in real time. They can record the required attributes for a siren inspection—such as whether or not the siren is functioning and if there is vegetation that could interfere with its operation—and simultaneously view and correct each siren’s mapped location. With the siren data now housed in Lucity’s enterprise asset management software, the GIS features are linked to their related maintenance work orders. In addition to optimizing how TCEMA tracks siren inspection and condition data in the field, this real-time process enables the agency to complete its inspection and maintenance reports more quickly and accurately. By giving authorized employees shared access to and visibility of important public service information in the ArcGIS platform—at any time, and from anywhere—TCEMA was able to achieve higher levels of productivity. Perform routine maintenance on outdoor warning sirens. Ensure that sirens are in proper working condition. Maintain regulatory compliance regarding safety and operational readiness. Achieve the desired level of disaster preparedness. Using Survey123 for ArcGIS, EMA specialists can check a siren’s location on the agency’s existing map at the same time that they conduct a siren inspection. 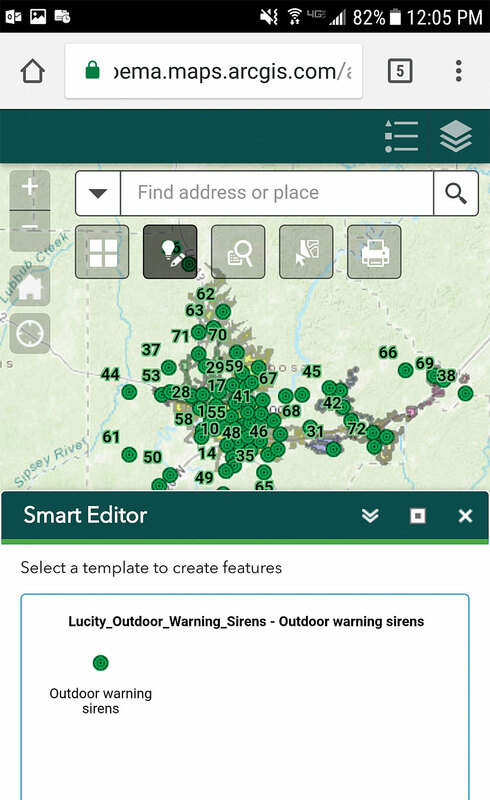 By leveraging the mobile and web capabilities of the integrated ArcGIS platform, TCEMA has achieved significant efficiencies in managing its outdoor disaster warning systems. Using focused, mobile apps together with the spatial, interrogative, and analytical functions of ArcGIS Online has made it easier for field operations staff to check, fix, and report on critical assets, as well as to coordinate response activities during disaster events. As part of its ongoing endeavor to further optimize field visits, the agency is looking to use Navigator for ArcGIS, which is also integrated with the Lucity work management platform, to help siren inspectors and maintenance workers travel more efficiently to each siren’s location when needed. This is expected to strengthen TCEMA’s operational foundation and boost workforce productivity, helping the small agency meet its goals more effectively. Deierhoi, along with his colleagues, looks forward to continuing to expand the county’s use of GIS and enterprise asset management technology to support additional improvements in emergency management and response across Tuscaloosa County. Raj Patil is the director of strategic partnerships, marketing, and international business at Lucity.